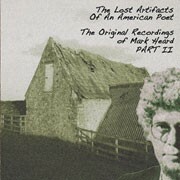 "The Lost Artifacts of an American Poet, Vol. II"
The second volume in this series sees 11 more demos recorded at Solid Rock Studios in the '70s by the late US Jesus music pioneer Mark Heard. Less Christian in context than the previous installment, Heard's natural flair for songwriting is captured in the delightful "Bluegill On The Line" and "To Walk In The Wood" which betray his melodic sensibility as well as a country boy persona. Nonetheless, Heard references his relationship with God in the evangelical "Goes A Long Way" and the Christmas song "Bethlehymn." More experimental than its predecessor, songs such as "Life's Ocean" and the wonderful "Not Alone" may well have come from his time as a member of the short lived folk rock band Infinity+3 but unfortunately the liner notes do not shed any light on this matter. Another Infinity+3 track, the cryptic "Second Best Friend," makes an appearance to seal what is already a hugely enjoyable release.